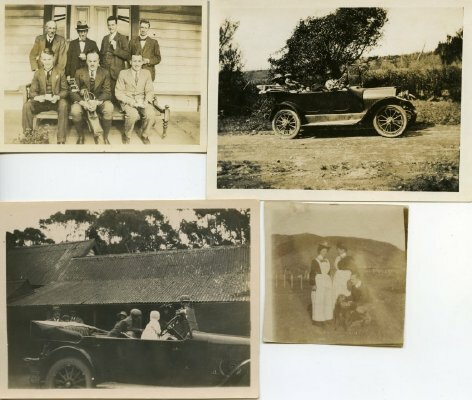 Description Collection of 17 photographs of Everard M. Stace and friends from Stace collection. 1. Everard M. Stace (seated, centre front) with golf clubs and friends. 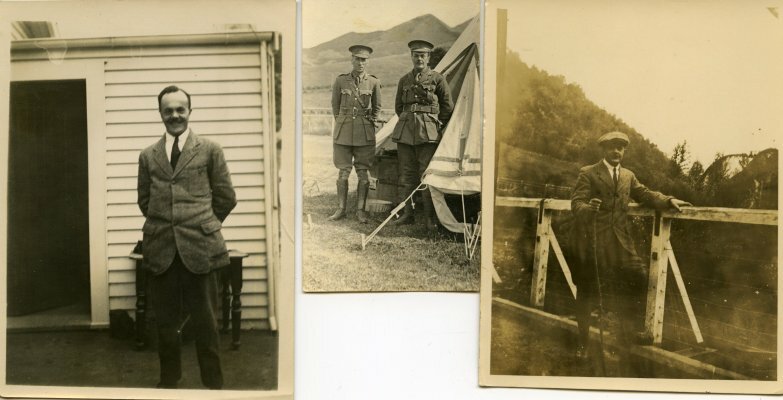 6 men in photograph unidentified. 2 copies of this photograph. 2. Everard M Stace (seated, centre) and 3 women in a car. 3. Children standing in car. Everard M Stace standing behind car. 4 other adults (3 women & 1 man) standing near the car. 4. Everard M. Stace crouching with dog beside two women wearing aprons. 5. Everard M. Stace, standing in front of building. 6. Everard M. Stace with Captain Hawthorne. Quoted on back of photograph Captain Hawthorne (ex. O.C. 'A' company - which I now have) and I taken outside our tent at the Harori last March. Bennett of our office took this. Love Everard. 20-06-17". 7. 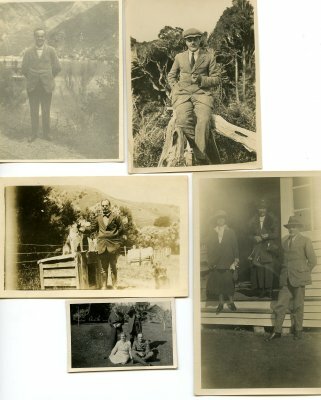 Everard M. Stace, standing beside fence, on a tramp at Pipiriki. 8. Unknown woman leaning on fence, on a tramp at Pipiriki. 9. 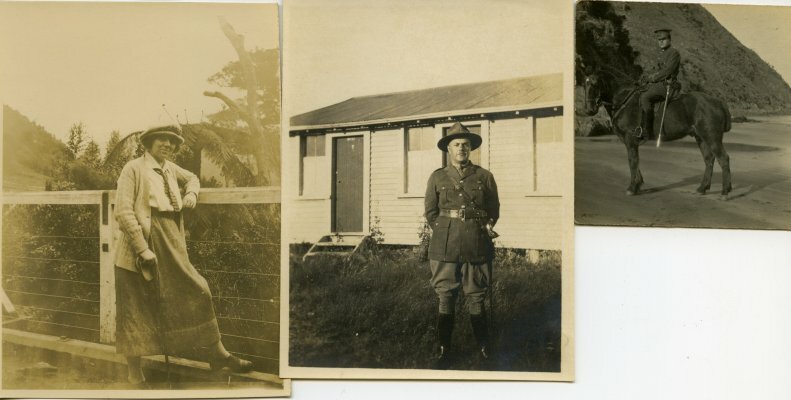 Everard M. Stace in uniform outside building (possibly barracks). 10. Everard M. Stace, in uniform, on horseback, on a beach. 11. Everard M. Stace, standing by a river (or lake). 12. Everard M. Stace, seated on a tree stump, with a pipe. 13. Everard M. Stace with dogs, outside near fence and kennel. 14. Everard M. Stace standing outside house with two women standing on steps of porch. 15. 4 people in garden. Everard M. Stace in uniform, seated on ground, beside young woman. Couple standing behind. 16. 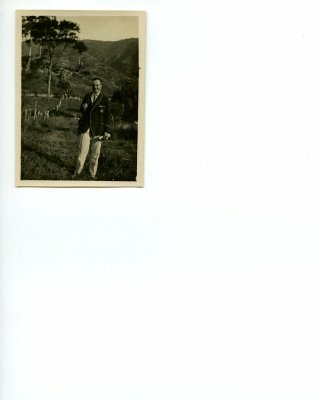 Everad M. Stace standing near a fence at foot of some hills.